Cybercriminals are targeting growing businesses like yours more than ever before. Once spam actually reaches an inbox, it leaves your whole business at the mercy of your staff member doing the right thing. There are many thing that set CudaMail apart, but the one that we hear the most about is our support. We hear that with many other services, it's practically impossible to actually speak to another human. People are always surprised to call during office hours and speak to us. However, that's nothing compared to the first time one of us actually calls a client to see how things are going! Special config issues? We can help? Is Your Organization Looking for a Reliable Managed Email Filtering Service You Can Talk to If You Have a Question? 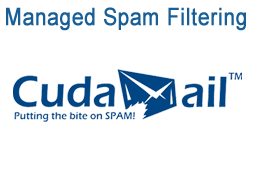 The CudaMail™ Partner Program lets you make money by offering enterprise level spam filtering to your clients. Our anti-spam specialists are expert in helping you configure your network for CudaMail spam filtering. You can be set up and spam-free faster than you think! Optrics offers personalized CudaMail coaching - you get access to the CudaMail Portal, and if you have any questions, we're probably the only large anti-spam company that you can actually call and talk to a human during business hours!